Successful partnerships are key to our continued growth. Throughout our supply chain, we commit ourselves to the highest standards in our industry. Pioneering the way for our industry, Anderson Hay has become the premier supplier of forage products to the world. We export high quality forage to over 100 ports around the world. Innovation, integrity, and dedication are the hallmarks of our operations from seed to ship. We supply our customers with the quality products they need, delivered year-round. Timothy hay is known around the world as the highest quality feed source. It supplies exceptional fiber and is great roughage. 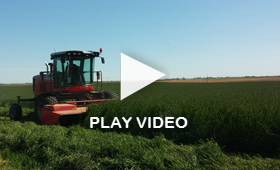 Alfalfa hay is one of the best and most popular horse feed varieties available. It's also a popular choice in the export and domestic markets for top producing dairy cows. Rye grass, fescue grass, orchard grass and blue grass. Learn more about these high quality types of straw we offer for dairy and beef cows. we've grown to become the largest hay exporter in the U.S.
Over the last several generations, Anderson Hay & Grain Co., Inc. has become the leading exporter of hay and straw products, specializing in Timothy Hay, Alfalfa Hay and Grass Straw products. We remain committed to our core values of building strong relationships, honing our operational expertise and earning respect through unwavering principles. Established more than a half a century ago by our family founders, our values have sustained our pioneering expertise and are the foundation of our success. From planting to harvest, we team with our grower network of family-owned farms specializing in hay and straw production to provide a consistent supply of top quality products to our customers all year round. Our efforts in quality control start with our growers and move through our entire operation. Started as a small family enterprise, we've grown to become the largest hay exporter in the U.S.
"The goal of the company is to improve our industry and enrich the agricultural communities we live and work in."